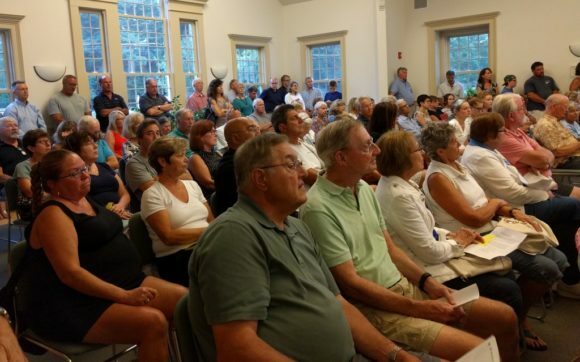 There was standing room only for some residents attending Monday night’s Special Town Meeting in Old Lyme. 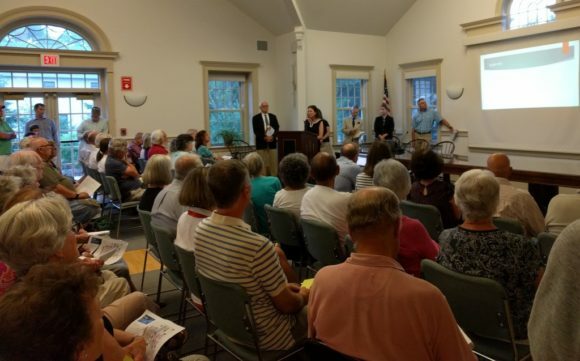 UPDATED 7/24: FULL STORY NOW ADDED — More than 140 people packed into the Meeting Hall at Old Lyme Town Hall Monday evening to cast their votes on whether the Old Lyme-Phoebe Griffin Noyes Library should receive $1.75 million from the town coffers to fund its planned renovations. Library Director Katie Huffman explained the library needs in part to be renovated due to the dramatic changes that have occurred in the way people gather information in the past 25 years, when the last renovation took place. The advent of social media and smartphones, the decreasing cost of technology, and a dramatic increase in publishing and the availability of information have changed people’s information needs. She said, “More and more people are coming in with their devices … more people are studying remotely.” adding, “people need space for Skype interviews and to take exams.” She pointed out these changes have resulted in a 70 percent increase in reference questions since the new building opened in 1996, a 90 percent increase in library programs, and a 140 percent increase in attendance at those programs. Library Building Committee Chairman Ken Biega addresses the audience. Library Building Committee Chairman Ken Biega explained the costs of the project saying the total project cost will be $3.05 million. This cost will include both construction and soft costs, such as furnishings, technology, and shelving. It also includes a built-in construction contingency fund. First Selectwoman Bonnie Reemsnyder discussed the impact of the project on homeowners in Old Lyme. She said the owner of a house appraised at $347, 200 would pay conservatively an additional $24 per tax year for the next 15 years. The respective number for a house appraised at $540,200 would be $38. 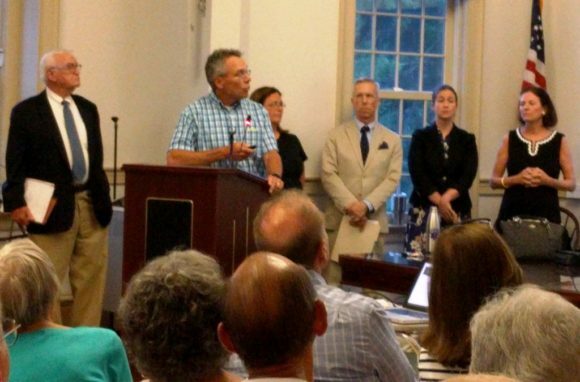 Reemsnyder cautioned that the Town was “not definitely borrowing the full amount,” and that, if that were the case, Old Lyme taxpayers would pay less. Library Board Chairman Lynn Fairfield-Sonn answers questions from the audience..
After a couple of quick questions from the audience answered by Library Board Chairman Lynn Fairfield-Sonn, residents voted first in a hand vote that McGarry called in favor of the Ayes. 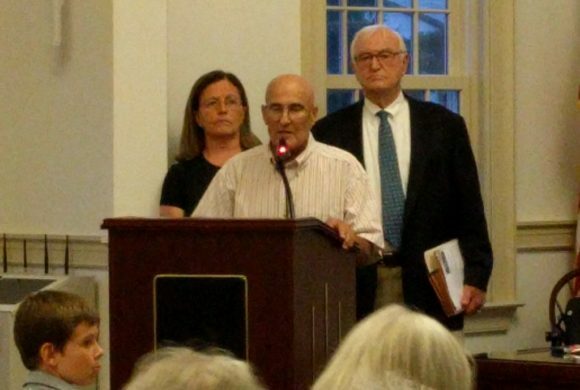 One resident, however, wanted to know the exact count and so the vote was repeated with residents holding up cards denoting they had been approved as legitimate Old Lyme taxpayers. When the hand votes had been counted, McGarry announced to loud applause that the motion had passed by 104 votes to 30. Harbor Commission Chairman Steve Ross proposes the new ordinance, with First Selectwoman Reemsnyder and Attorney McGarry standing behind him. The second motion established a new ordinance to amend the Town’s Harbor Management Plan. Harbor Commission Chairman Steve Ross explained the Town “needed a variance if there is a hardship” and this ordinance will create a procedure for the Harbor Management Commission to recommend variances from the Harbor Use Zone Standards of the Plan to a state or local permitting authority in Old Lyme waters. After Ross had made a motion to approve the ordinance, McGarry called for a show of hands. There was no call for vote count this time and the motion was carried by a convincing margin.